Forty years ago, there was a popular misconception within the veterinary field that vaccines could be given continuously without harming the animal. Since then, vets learned that vaccines last a lot longer than a year: most likely for the animal’s life. More recently, the dangers of vaccination have been brought to light. Some vets are paying attention while others still use repeated vaccination. They either don’t believe or know of the research, or they’re protecting their income. 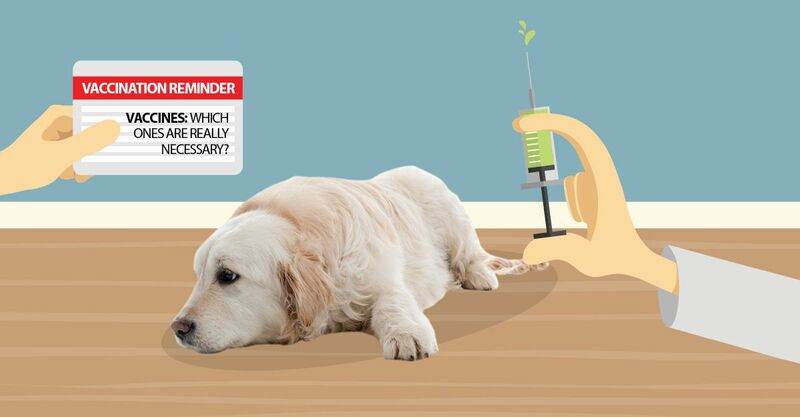 Pet owners have two choices: allow their vet to decide how often their pets are vaccinated, or research vaccine safety and take an active role. 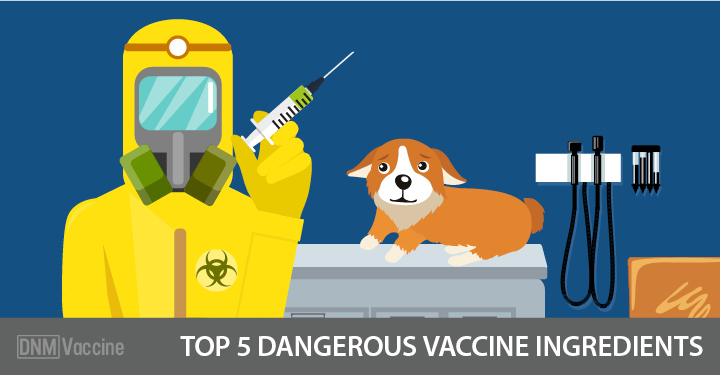 For pet owners who wish to protect their pets from unnecessary vaccination, here are five vaccine ingredients they should know. Aluminum is the most common adjuvant in veterinary vaccines. Aluminum is linked to the degeneration of the brain and nervous system. It can also cause neurological dysfunction. It promotes brain inflammation, oxidative damage, reduces the levels of brain antioxidants (i.e., glutathione) and disturbs calcium homeostasis. In the immature and developing brain, it might lead to a number of neurodevelopmental conditions in humans, such as seizures. In the mature (especially the aging brain), these mechanisms can lead to progressive neurodegeneration, such as Alzheimer’s disease and ALS. Alzheimers disease is caused by plaque formation in the brain and chemical analysis shows an aluminum core at the root of each plaque. Research at UC Davis in California suggests up to 39% of aging dogs have at least one sign of dementia. The dogs hade the same plaques as Alzheimer’s patients. Leading immunologist Hugh Fudenberg MD, says that humans who received five flu vaccinations between 1970 and 1980 are ten times more likely to get Alzheimer’s Disease than those who had only one or two shots. Fudenberg attributes this to aluminum and mercury, which almost every flu vaccine contains. The gradual accumulation of aluminum and mercury in the brain leads to cognitive dysfunction. To learn more about how aluminum creates neurological disorders, read Dr Russell Blaylock’s recent contribution to Current Inorganic Chemistry. This mercury based additive has been used as a preservative for decades – and apparently the extreme neurotoxicity that mercury in general and Thimerosal in particular have also been known for decades. “We have obtained marked local reaction in about 50% of the dogs injected with serum containing dilutions of Merthiolate (Thimerosal). Merthioiate is unsatisfactory as a preservative for serum intended for use on dogs.” (Director of Biological Services, Pittman-Moore Company, letter to Dr Jamieson of Eli Lilly Company dated 1935. U.S. Congressional Record, May 21, 2003, E1018, page 9). Since then, repeated studies show the dangers of Thimerosal. In 1967, a study in Applied Microbiology found Thimerosal killed mice when added to vaccines. In 1972, Eli Lilly found Thimerosal to be “toxic to tissue cells” in concentrations as low as one part per million (PPM), 100 times weaker than the in a typical vaccine. Despite all of this ongoing and emerging data, Eli Lilly “continued to promote Thimerosal as ‘nontoxic,’” even including Thimerosal in topical disinfectants. In 1977, ten babies at a Toronto hospital died when an antiseptic preserved with Thimerosal was dabbed on their umbilical cords. In 1982, the FDA proposed a ban on over-the-counter products containing Thimerosal. In 1991 the FDA considered banning Thimerosal from animal vaccines. Finally, in 2006, researchers at UC Davis published a study connecting thimerosal with disruptions in antigen presenting cells known as dendritic cells obtained from mice. Researchers and parents had previously proposed links between childhood vaccines and autism, a neurodevelopmental disorder that affects language skills and social interactions. The UC Davis study indicates that in addition to being a direct neurotoxicant, Thimerosal may also be an immunotoxicant, leaving the immune system vulnerable to microbes and other external influences. Samuel R. Goth et al., Uncoupling of ATP-Mediated Calcium Signaling and Dysregulated Interleukin-6 Secretion in Dendritic Cells by Nanomolar Thimerosal. Today, most veterinary vaccines still contain Thimerosal, despite the dire warning signs that have been present for nearly a century. Why is Thimerosal necessary for vaccines? Well, it turns out it isn’t. Thimerosal has one function. It allows vaccine manufacturers to package vaccines in multi-dose vials. This means each vaccine will cost a few dollars less. Thimerosal would be completely unnecessary if vaccines were manufactured in single dose vials. 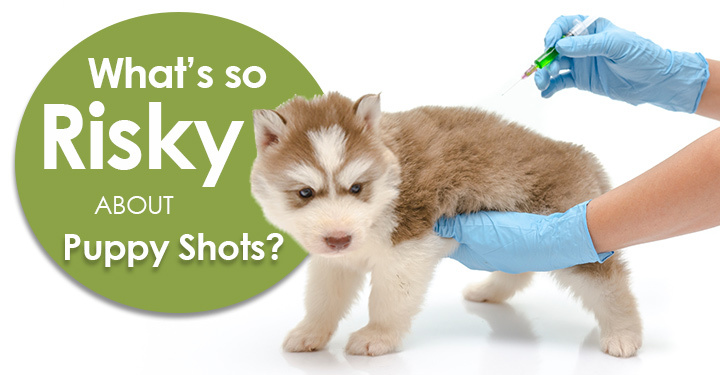 Contaminants found in vaccines are also behind many of the adverse reactions we see in dogs. “Contaminant” means anything that shouldn’t be there. That’s anything impure or unclean, is toxic or poisonous, or has the ability to create disease. Vaccines contain contaminants that can cause cancer, leukemia, autoimmune diseases and a myriad of other unwanted conditions. An important scientific paper was published in April 2010 in the Journal of Virology (Isolation of an Infectious Endogenous Retrovirus [RD-114] in a Proportion of Live Attenuated Vaccines for Pets, Journal of Virology, April 2010, p 3690-3694, Vol 84, No 7). It showed how two teams of scientists, in Japan and the UK, isolated a feline retrovirus (called RD-114) in both feline and canine vaccines in the UK and Japan. Had teams from America, or Germany, or Kazakhstan also been looking, they would probably have found the retrovirus, too. The contamination involved seed stock – the witches’ brew of disease shared amongst vaccine manufacturers internationally, from which they make their vaccines. Translation: they found this cat retrovirus in a highly malignant human tumor. “Xenotropic” means that it will be harmless in the original host species, but will cause problems (like tumors) in a different species. The only official checks made for contaminants in vaccines are for a few known pathogens, potentially missing a vast host of unknown, unstudied, small particles and chemicals. It’s simply impossible to remove contaminants from vaccines. Disease micro-organisms are often cultured on animal tissue including embryonic chickens or cow fetuses. When a vaccine is manufactured, it is impossible to divide the wanted virus from the unwanted animal tissue. It all gets ground up together and injected into your dog’s body. If a dog eats animal flesh or an egg, it is digested into simpler amino acids before entering the bloodstream. The digestive process in most cases changes protein molecules so they don’t trigger an immune reaction. This is not the case for vaccines. They are injected undigested, directly into the bloodstream, where the foreign protein matter circulates throughout the body. An immune response is triggered when the body detects foreign proteins. Killer cells (white blood cells) are sent out to consume the cells containing the foreign proteins and protein fragments. This process is nature’s way of protecting the body from being overwhelmed by invading organisms and eventually succumbing to them. The foreign protein fragments are not always destroyed by the body as it is busy cleaning up the multiple viruses that have just been injected, along with the serious chemicals aluminum, Thimerosal, formaldehyde and more. So the foreign protein matter gets absorbed into body cells. T-Cells, sensing they are there, but unable to reach them directly, attack the body cells that harbor them. This can lead to autoimmune disorders including cancer, allergies, arthritis and more. “Our ongoing studies of dogs show that following routine vaccination, there is a significant level of antibodies dogs produce against their own tissues…Some of these antibodies have been shown to target the thyroid gland, the connective tissue such as that found in the valves of the heart, red blood cells, DNA etc.” Larry Glickman DVM, referring to the results of the Purdue Vaccine Studies. The final vaccine ingredient to be discussed isn’t injected into dogs, but the concept of vaccination itself. In 2005, the global vaccine market was $6 billion. In 2012, it is $34 billion. It’s not surprising that more vaccines are manufactured for dogs and media hype frightens pet owners into using them. The canine influenza vaccine is an example. In 2011, the media heavily covered canine influenza and the need for vaccination. At the center of most of the media articles reporting the need to vaccinate for canine influenza was Dr Cynda Crawford. Dr Crawford is a veterinarian at the University of Florida (UF) who led the research team that first identified the canine influenza virus in 2004. Interestingly, Crawford, along with colleagues at UF, Cornell University and the U.S. Centers for Disease Control and Prevention (CDC), share intellectual rights to the canine influenza virus; Merck has licensed the right to use the virus to make a vaccine. However, Crawford maintains that she and the others do not receive compensation from vaccine sales. “Some veterinarians suspect that vigorous marketing of canine influenza vaccine plays a part in confusing perceptions of disease prevalence. Vaccine manufacturer Merck confirmed it markets the vaccine through “education of boarding facility operators, kennels, pet owners and veterinarians about the disease state and about steps they can take to encourage prevention.” Told that some are concerned about overzealous marketing, Merk had no comment. When the dust settled in 2011, it appeared that canine influenza wasn’t that big a deal after all. Dr David Lewis, director of consultation services at Antech Diagnostics and a consultant on VIN, said his lab saw no unusual flu activity outside of the New York City area in 2011. [NOTE] So why do vets continue to vaccinate for the dog flu? Watch our top 5 vets take on common vaccine issues, like these, at this year’s NCHS Roundtable. This is the first time we’ve ever hosted a roundtable. Grab a ticket here and join us live at the largest online canine symposium in the world! Cornell University Animal Health Diagnostic Center reported an uptick in positive results from greater New York City as well as from a single kennel in San Antonio, Texas. Idexx noticed eight cases in California, three in New York City and ten cases in Texas. Clearly, there was very little risk from canine influenza but much profit to be made. The veterinary associations also have a pro-vaccination agenda. Animal vaccine researcher Dr Ronald Schultz says, “Few or no scientific studies have demonstrated a need for cats or dogs to be revaccinated.” Dr Schultz published An Ideal (But Not Proven) Immunization Schedule for Dogs and Cats in 1978 and followed up with research where dogs where challenged with exposure to Distemper, Adenovirus and Parvovirus, anywhere from one to 11 years after vaccination. Every single dog was protected when exposed to the virus. “The results from this limited group of dogs clearly demonstrated the Norden modified live vaccines providedimmunity for at least 11 years against CDV and CPV-2″ says Dr Schultz. Why did the vets advocate a three year recommendation when the data showed vaccines lasted for at least seven years? Learn more about the AAHA vaccine guidelines. Vaccination is fraught with problems that weren’t considered even a few short years ago. Vaccination programs should consider both the benefits and the inherent risks of each vaccine given to companion animals. Some vets are able to see through the politics and money that drive revaccination while others can’t. To protect their pets from unnecessary vaccination, pet owners must discover which camp their vet is in. “I believe that before we continue to inject foreign substances year after year into our pets which I believe can cause them harm, that we should first make sure they absolutely need it. If they don’t, why do it?” says Michael Goldberg DVM. That’s a very good question indeed and one that both vets and pet owners should be able to answer. Yearly Pet Exams – Are They Necessary?